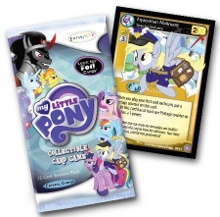 Gen Con News: At Gen Con, ICv2 sat down with Enterplay President Dean Irwin and SVP Marketing and Product Development Gail Tilden, who shared details on upcoming My Little Pony CCG releases, including updated information on the Celestial Solstice Deluxe Box Set, staggering the Crystal Games expansion product releases, and plans to start utilizing prerelease sets with next year’s Absolute Discord expansion. "With Crystal Games, which is the second expansion to the game, we’re going to launch the Theme Decks three weeks prior to the Booster Packs," said Irwin. "Prior to this, we’ve shipped them at the same time." The Theme Decks are scheduled to release in late October, with the Booster Packs releasing in early November. Crystal Games will include the new Mane Characters: Special Pony (fan name Derpy), Spike, Princess Cadence, and CMC/Cutie Mark Crusaders. It will introduce the new mechanic of Teamwork. The new set will include nearly 200 new cards. 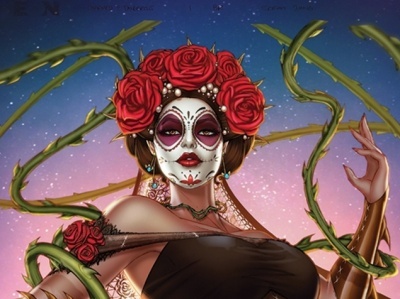 Enterplay also shared updated information and highlights for the Celestial Solstice Deluxe Box Set (see "Summer 'MLP CCG' Releases"), which is now planned for an October 1st release. 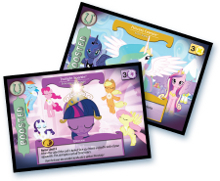 "In the Celestial Solstice Deluxe Set, we’re going to make the Mane Character cards a little extra special," Irwin shared. "Because you don’t have to put them in the deck, and shuffle them in the deck, we’re going to make them oversized and 3D lenticular, so hopefully the characters will look like they’re floating a half inch or so above the card." 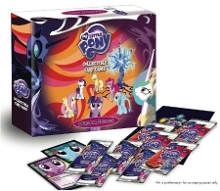 Packaged in a collector’s box, the Celestial Solstice set will include 3 Premiere Packs, 3 Canterlot Nights Packs, 24 Foil Cards (3 each of 8 cards), 6 dividers, 70 card sleeves (10 for Problems, 60 for Draw Deck) and 2 oversized lenticular Mane Character cards of Twilight Sparkle and Princess Celestia. 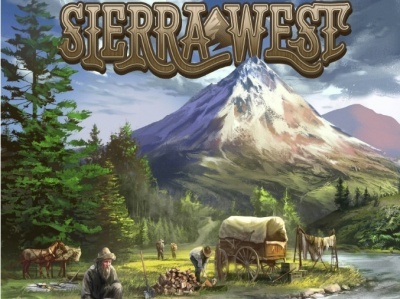 Enterplay has been steadily growing its organized play with both monthly OP kits, and by including more stores in its limited Prerelease Premieres with each new release. "We went from 15 [stores] the first time, to 100 the second time, and we’re really making it more open to more store locations," Tilden said of the Prerelease Premieres. "By the time Absolute Discord comes out, (which is planned for February 1, when we solicit the product to our distributors), we’re going to solicit pre-release kits at the same time, so it will be a very broad pre-release program and it will be more organized, so that way they can get product the way they would normally order it," Irwin said.